Tjeerd Kuipers was born in a family of carpenters and builders in Friesland and followed his family to Amsterdam in the late 1870's. Before that he had worked as a pupil at the office of architect J.P.J. 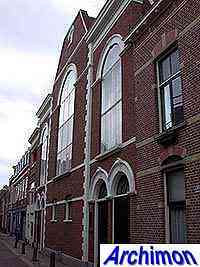 de Rooy in Leeuwarden, after which he had had a job for the municipality of Meppel. 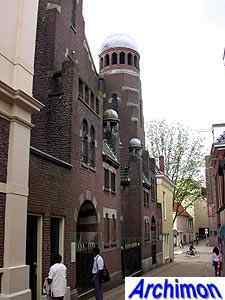 In Amsterdam he first worked for Salm and later for the Sanders and Berlage firm. H.P. 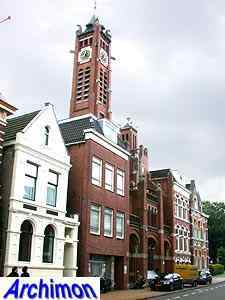 Berlage would become a major influence on Kuipers' work. In 1884 Kuipers won the first price in a contest for farm-design at the international agricultural exhibition in Amsterdam. 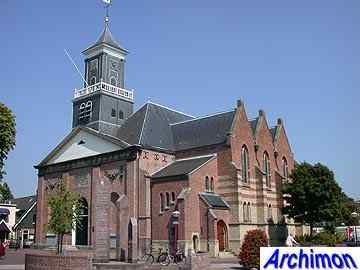 His first design that was actually built is a school in Buiksloot (NH) in 1886. But he became best known for his protestant churches, of which he built ca. 50 throughout the country. Kuipers' career largely parallels the development that protestant architecture went through from ca. 1890 until 1940. 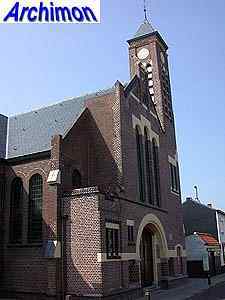 His early designs are in the neo-Renaissance style, which was replaced by Berlagian Rationalism mixed with Jugendstil after 1899; churches of this period have clean brick walls, decorated by pieces of natural stone to accentuate certain parts. This style usually is simply called Rationalism as well. 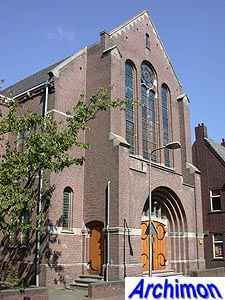 In his last designs Kuipers used a moderate form of Expressionism. 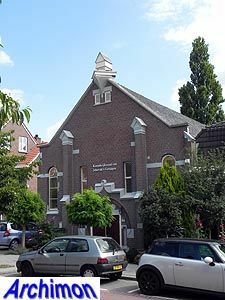 Between 1888 and 1928 he designed more than fifty churches, mostly for the Gereformeerde Kerk* of which he was a member, and at least one synagogue. Many of these churches have been demolished or destroyed otherwise since. 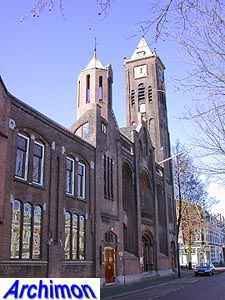 Besides churches, Kuipers also designed various offices, warehouses, schools and other buildings. 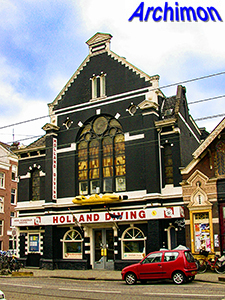 One of his most memorable creations is a group of houses in imitation national styles of various countries in the Roemer Visscherstraat in Amsterdam (1894), the Seven Countries' Houses. 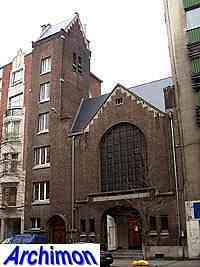 Tjeerd's brothers Roelof (1855-1922) and Foeke (1871-1954) became architects too. The three brothers occassionally worked together in various combinations, in these cases mainly designing warehouses and factories. The following is a list of the churches, for as far as known. 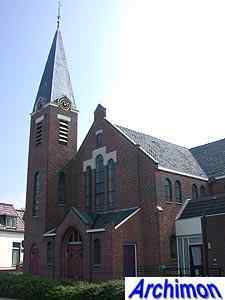 An alphabetical listing, with many old pictures, of Kuipers’ churches, can be found at Peter Dillingh's page (external link, page in Dutch, opens in new window). 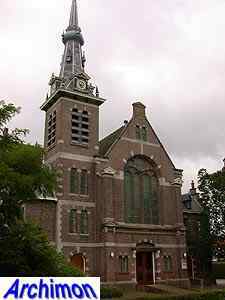 *The name of this branch of protestantism is hard to translate: Gereformeerd means reformed, just like Hervormd does, but there are differences between these two calvinistic denominations. In the following the Dutch words are used to avoid any further confusion. Entry in a competion, not executed. No further details. 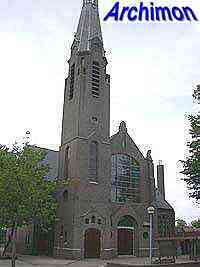 A case of plagiarism; Kuipers designed a towerless church in neo-Renaissance style. 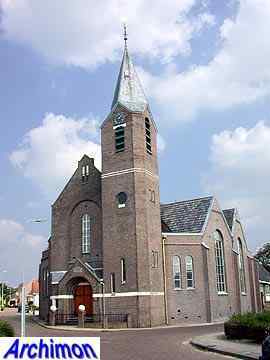 The drawings were handed over by the church-counsel to contractor H. van Es who copied the design and was commissioned to build the church. Click here for a picture of this church (opens in new window). 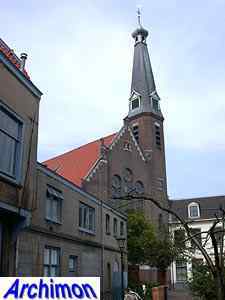 The first of Kuipers' churches that was built is a towerless church in neo-Renaissance style. Demolished 1964. Wide church in neo-Renaissance style, with two towers. Demolished 1975. Church in neo-Renaissance style with tower. Church in neo-Renaissance style, with two towers at the front. This design won a competion in which it was, according to a critic, not as bad as the other entries. Destroyed by bombs in May 1940. Assignment was preceded by a contest, won by Kuipers. Church in neo-Romanesque style, hidden behind the facade of a 16th-century house. Towerless church in neo-Renaissance style. Now a shop. 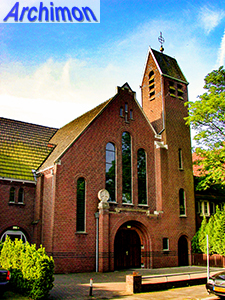 Church in moderate neo-Renaissance style. Closed 1964, now used by the Jehovah's Witnesses. Originally with a steeple at the front, the current 'tower' was added by the new users. Church in neo-Renaissance style mixed with decorative elements inspired by Gothicism. Tower with tall spire standing offset to the right in front of the facade. After the upper half of the tower had been demolished in 1963 the building served as a theatre until demolished in 1987. Church in neo-Gothic style with small tower at the front. Demolished 1928. Towerless church, Romanesque and Gothic influences. L-shaped ground-plan. Simple towerless church with Romanesque influences. Demolished 1989. Church with influences from both Romanesque and Gothic architecture. Two towers of different size at the front. Behind the front is an almost circular centralizing space which is entirely covered by a low dome. Church in Rationalist style. Enlarged in 1918. Church in Rationalist style, with square open tower. Enlarged in 1909. Towerless church in Rationalist style. 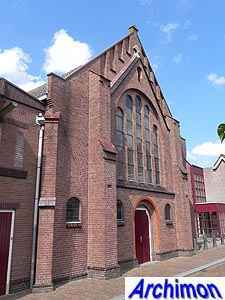 Already abandoned in 1908, used by the Hervormde kerk from 1910-1939, and by the Jehova’s Witnesses since 1979. Richly ornamented church in an unspecified style, but with Rationalist influences. Front with two differently sized towers. 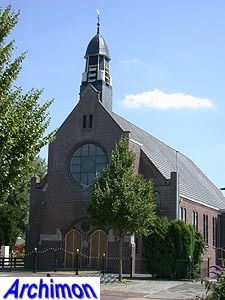 Church rebuilt into apartments 1983-1985. Designed in cooperation with Y. van der Veen. Small towerless church in Rationalist style. New entrance added in 1979-1980. Church in Rationalist style. Demolished 1967. Church in a combination of styles. Destroyed 1944. Building with front with two towers, in Rationalist style combined with Moresque influences. Designed in cooperation with Y. van der Veen. 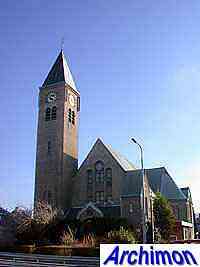 Church in Rationalist style, with tower. Demolished 1971. Church in Rationalist style, with two different-sized towers at the front corners. Demolished 1995. Church in Rationalist style, with tower. Demolished 1972. Towerless church in Rationalist style. Destroyed in 1944, like most of the rest of this village. Small church in Traditionalistic/neo-Romanesque styles. Diagonally positioned steeple at the front. Small church in Rationalist style, with diagonally positioned steeple at the front. Church built in a combination of neo-Renaissance and Rationalist styles. Tower rebuilt after a fire in 1928. 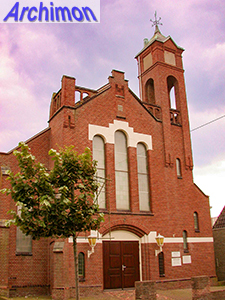 Church in Rationalist style, with two different square front towers. Demolished 1982. Church in moderate Rationalist style. Demolished 1973. Towerless church built in a combination of Rationalist and neo-Romanesque styles. Demolished 1981. Towerless church in Rationalist style. Badly mutilated with different windows and painted white in 1962. Abandoned 2000. Church built in a combination of Rationalist and Romanesque/Gothic styles. Polygonal tower at the right hand front corner. Demolished after having been abandoned in 1974. 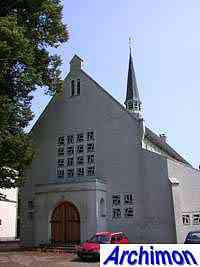 Church in simple Rationalist style with short tower with saddle-roof standing offset to the left, and with choir-like polygonal back. Out of use in 1969. 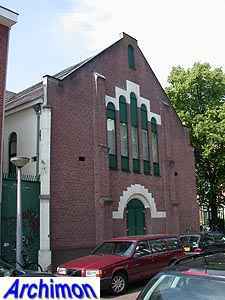 Mosque 1973-1988. 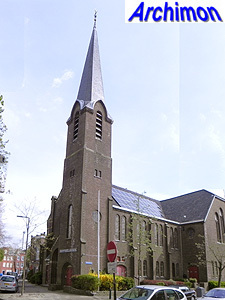 Roman Catholic St. Antonius van Paduakerk since 1991, after the nearby church by J. Stuyt had been demolished. Towerless church in Rationalist style with Romanesque influences, especially at the entrance. 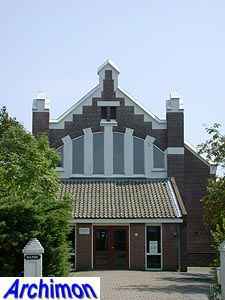 Church in Rationalist style with polygonal ground-plan, built at the tapered corner of two streets, filling the available space as effectively as possible. The facade was changed once, and originally had a rose-window. Church in Rationalist style. Demolished after closing in 1972. Church in Rationalist style. Small belltower on top of the front. 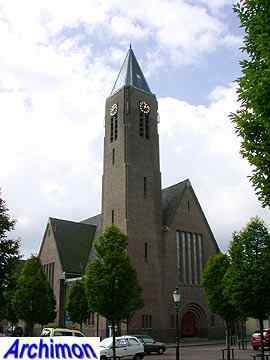 One of Kuipers' most monumental churches, thanks to its front with two polygonal towers of different sizes, which creates the impression that the church is much larger than it actually is. Built in Rationalist style, with perhaps a few touches of moderate Jugendstil. The building, which occupies a rather small piece of land on the corner of two streets, has a centralized main space with a polygonal ground-plan. Church in Rationalist style, with built-in polygonal tower. Destroyed by fire in 1964. Church built in a combination of styles, with monumental front tower. Often considered Kuipers' best work. Demolished 1969. Church in neo-Romanesque style. Nowadays in use by the Gereja Kristen Indonesia. 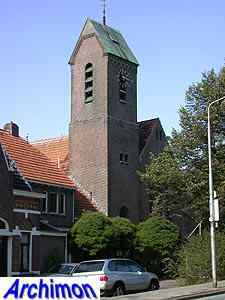 Church in Rationalist style, with tower. 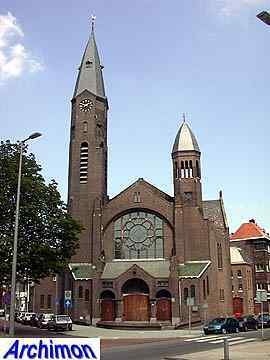 Church similar in style to the one in Eindhoven, but with the tower at the other side of the front. Abandoned 2000. A new nave is added to an older church, which as a result loses its octagonal ground-plan. 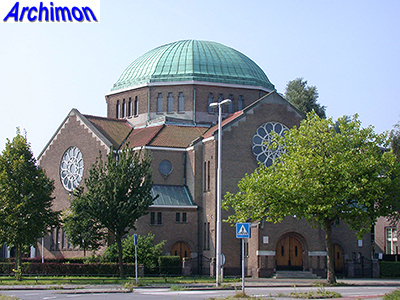 Dome-church built in a combination of Rationalist, Expressionistic and Romanesque styles. The building has a polygonal ground-plan, more or less shaped like an arrow. Church in moderate Expressionistic style, with tall tower. Demolished 1981. Third aisle in neo-Gothic style added, consisting of three traves, each with a seperate gable and roof, and a choir-like eastern part. Church in moderate Expressionistic style, with tower and pseudo-transept. Church in Rationalist style. Closed in 1995, now Russian-Orthodox church. Original small windows in the tower have been replaced by bigger ones.